Foot ulcers are wounds or open sores that will not heal or that keep recurring. The most common types of foot ulcers are venous stasis, neurotrophic (diabetic), and ischemic (arterial). Foot ulcers are defined by appearance, location, and the condition of the borders and surrounding skin. Venous stasis foot ulcers may be found just above the ankle. Red in color, they may be covered with yellow fibrous tissue. An infected ulcer may have a green or yellow discharge. The ulcer will usually have an irregularly-shaped border and discolored, swollen surrounding skin. The skin may feel warm or hot and may appear shiny and tight. Venous stasis foot ulcers occur in persons with histories of leg swelling or blood clots or varicose veins. Neurotrophic (diabetic) foot ulcers are commonly found at increased pressure points on the bottom of the feet. Trauma, however, can cause a neurotrophic ulcer anywhere on the foot. They may be pink/red or brown/black in appearance. The ulcer will have a punched out border and may have calloused surrounding skin. Neurotrophic foot ulcers occur in persons with diabetes or impaired sensation of the feet. Diabetics are prone to have foot ulcers more than any other people. Arterial (ischemic) foot ulcers may be found on the heels, tips of toes, between the toes, and anywhere else that foot bones protrude and rub against something. 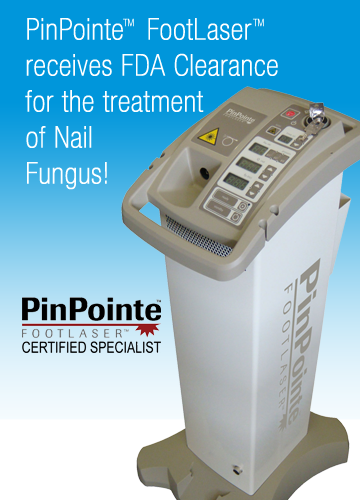 They may also be found in the nail bed if the toenail has cut into the skin. They do not necessarily bleed and are yellow, brown, grey or black in color. The ulcer will have a border and surrounding skin that appear punched out. An irritated or infected ulcer may exhibit swelling and redness around the base. When the leg is dangled the entire foot may be red. The foot changes to a pale yellow/white color when the foot is elevated. Arterial foot ulcers can be extremely painful. They most often occur in persons with poor circulation in their legs as well as any accompanying disorders. Foot ulcers can be caused by a variety of diseases and medical conditions. In addition, they can be caused by pressure on the foot, heredity, a history of smoking, and some medications. Dr. Burmeister will be able to diagnose a foot ulcer by getting a complete history of your symptoms and by doing a thorough examination of your foot. He may also order an x-ray, MRI, or CT scan to fully diagnose the condition. Other tests may be conducted to rule out underlying conditions. Treatment for all types of foot ulcers may include antibiotics, anti-clotting drugs, wound dressings, compression bandages or garments, prosthetics, orthotics, and the wearing of proper shoes and socks. Other treatment options may be required according to the type of foot ulcer. In all cases, proper home care is critical to the healing process of the foot ulcer. Dr. Burmeister will provide you with instructions outlining what you will do to care for your wound at home. Foot ulcers are prevented by successful management of the medical condition or disease that could cause them. Not smoking, exercising, and maintaining a healthy weight will also be helpful in preventing foot ulcers. Check your feet every day, and see Dr. Burmeister on a regular basis. If unnoticed or untreated, redness, sores, swelling, cuts, blisters, ingrown or infected toenails, or bruises can lead to foot ulcers. If you are unable to do visual inspections of your own feet, ask for assistance from a friend or family member. If you notice symptoms of a foot ulcer, immediate care is critical. Dr. Jeffrey Burmeister, DPM, and his experienced staff are ready to fully diagnose, treat, and see you on your way to pain-free living. Schedule an appointment by calling (904) 765-8889 or by completing an online appointment request at our Contact Page.